Dramatic play in which the child reenacts the experience they see in the world about them is encouraged by having available dolls, dress-up clothes, and other role-playing materials. Small cars and trucks, toy animals and play people are frequently used in connection with block building and in understanding society’s functions. Experiences with literature — discussions, puppets, self-expression — aid in the child’s language development, in addition to helping them learn more about their world. Climbing, running, pushing and pulling are a few of the large muscle activities encouraged by the availability of slides, wagons and various climbing and building apparatus. These are also valuable for learnings in balance, body skills and socialization. Since these activities can best take place in an outdoor environment, the outdoor portion of our program is considered essential in order to maintain good health. Through the use of various art media such as finger painting, clay and easel painting, the child finds satisfaction not only in the expression of ideas, feelings and emotions, but also in manipulation, experimentation and construction. The program is designed to develop the child’s musical abilities and to further his interest in various musical forms. Music is an integral part of the daily program and includes singing, listening, rhythm games and activities, and dance. In addition to these daily activities, musicians and dancers are invited to school to perform for the children. The children are at an ideal age to develop the child’s lifetime enjoyment of music. 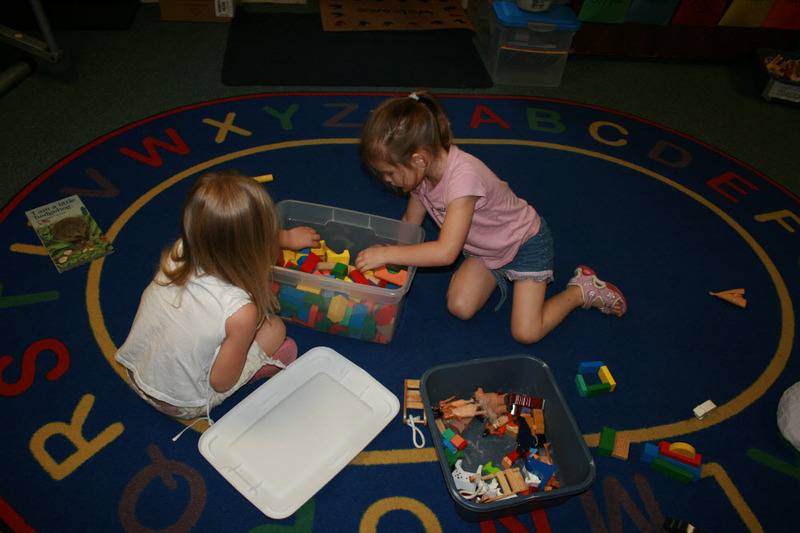 The Nursery School has equipment such as puzzles, mosaics, peg boards, etc. to help children with their small muscle coordination and perceptual development. These are some of the skills needed for learning to read and write. While your child may begin to read and write while at school, the emphasis is on making sure that he has the skills needed to develop these disciplines. The program also includes such activities as color and shape recognition, discrimination of everyday sounds, phonics, etc. The children are at an age when their speech is developing rapidly. Activities are planned to help with this development. The experiences at Nursery School and association with other children are especially helpful for children with speech problems. Relevant areas of interest are planned and developed to expand children’s knowledge, cognitive skills, curiosity, sense of order, and responsibility. Excursions and science experiences are an integral part of the program. The program is designed to further the child’s understanding about the world in which they live. Units of study such as: “All About Me”, “The Seasons”, “The Farm”, “Animals”, “Holidays”, “The Calendar”, “Good Health”, etc. are included. We emphasize counting actual objects, use of the counting frame, finding “more than”, “less than”, “bigger”, “smaller”, and some numeral recognition. We try to limit “show and tell” to the first school day of the week. If the toy or object is not appropriate for playing, it will be placed on the table until it’s time to go home, after the child has had time to talk about it. Weapons such as guns and knives or dangerous toys are not suitable for “show and tell”. We know that the children like to bring their toys and that is fine, but educational items are encouraged too! Parents may accompany the children on many of our trips. On our larger trips, we require at least one adult for every two children. This is a nice experience for both parent and child and we encourage parents to attend as many of these trips as possible. The parent acts as a guide to the child and points out items of interest. All children benefit from these trips and new experiences and parents should remember that the child reacts at his own level of interest. The teachers will talk to the children about what they will see and do, and what is expected of them. Preparing a child for a new experience goes a long way toward making the day enjoyable for everyone. Busy Bee sweatshirts and t-shirts are available in both adult and children’s sizes at school. We encourage the children (and adults) to wear these on field trips. It is nice for the children to have a small amount of spending money on these trips. If you do not accompany your child and he goes with another adult, please give money to the other adult. The next school day after a trip, the teachers will be doing follow-up activities at school. When the children bring their projects home, it is a good time to discuss the trip with them.